First off I wanted to thank you all who commented on yesterday's Talk It Out Tuesday post. I've replied to all of you. I appreciate all of your thoughtful comments. I enjoy reading all of your thoughts, and you all have some really great perspectives and opinions. Thank you for sharing them with me! I have to be honest. I do not think I've bought a single Zoya polish without there being a promo since I got into nail polish. I used to buy them full price, but ever since they started having regular promos I've taken them up on their generous offers! Thank you Zoya! I hope that doesn't make me seem greedy...they're offering! This is one I got recently with their January promo. The buy 2 just pay shipping one I think? Tobey is a bright fuchsia-pink creme. Love it!! 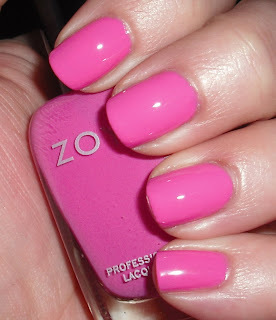 I love the Zoya promos. With the last one I got Dannii and Erika. I love Zoya and their promos! I like this shade in the spring and summer. It is such a cheery shade too. Oh, I only get Zoya on specials. I love the polish but I also love sales/deals! That is a very pretty pink. And I'm right there with you; I always buy Zoyas on promos. And I'm sure most people are the same way.